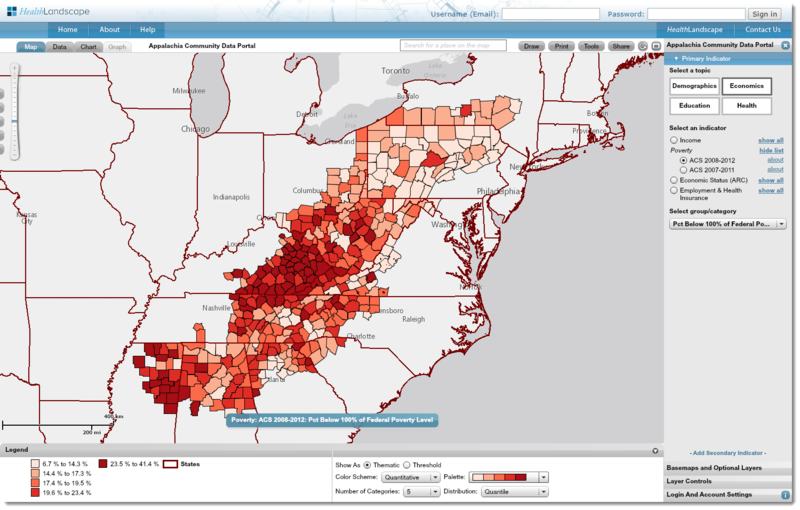 Blue raster is pleased to announce the release of the newest HealthLandsape tool – the Appalachia Community Data Portal. Created for the Appalachian region, the tool enables users to explore demographic, education, income, and health disparities for more than 400 Appalachia counties. The tool marries datasets from the the U.S. Census Bureau, the Appalachian Regional Commission, the Robert Wood Johnson County Health Rankings, and the Centers for Medicare & Medicaid. Using the Appalachia Data Portal tool, users can create side-by-side maps between indicators (for example, diabetes and poverty) to visualize potential relationships. Users can also overlay infrastructure data such as interstate networks or locations of Health Facilities, and start to visualize patterns between the two. Graphs and charts are available to see the numbers behind the data. Explore the Appalachia Data Portal, and more health information tools, at healthlandscape.org.